Today I spent some time making some preparations for the trip. I book my ferry ticket to Scotland on the Larne to Troon route - a single of course. I called 3 mobile and upgraded my contract to The One Plan, so I can tether to the laptop all I like form my iPhone when I'm travelling. I'm out of contract so I can do this on a month to month basis if I want, and reduce it again if I want. Its going to cost £25 per month for all the calls and texts and unlimited internet - pretty good! Yesterday evening I picked up a camera tripod, which will make my video making a bit simpler and allow me to get some of the shots I want without having to balance the camera on walls and fenceposts - I'm looking forward to using that, and I already have a few good ideas for a new video. This weekend a few, well eight, of us are off to Donegal on a wild camping trip. Its a chance for me to bid farewell to my friends here in Ireland and have a great time outdoors too. We plan to do some walking, kayaking, fishing, have campfires, and plenty of craic in the pubs there. 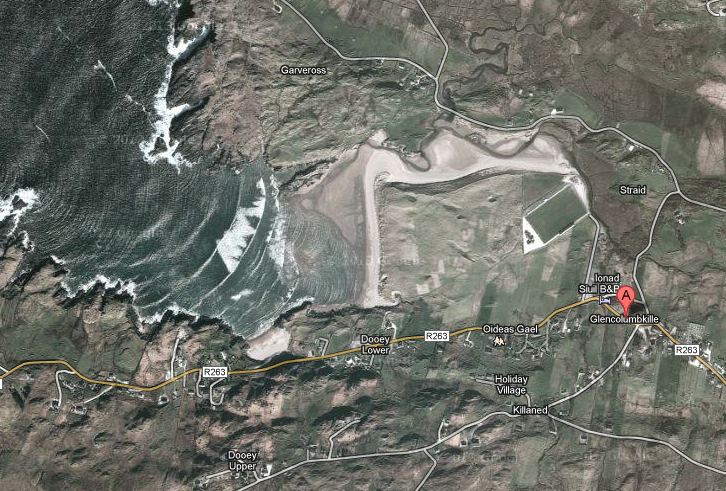 We are heading to a part of Donegal called Glencolumbkille which is west of Donegal town on the atlantic coast.. The area looks pretty good on from what I've seen in the photos online, and a few of the people going with me have been before and say its a great place to visit. We plan to set off on Friday morning and return Monday evening, so its a long weekend trip really, and its about a 3 1/2 hour drive from Belfast I think. It'll really set me up for heading off to the Scottish Highlands for June as well and will be a good tester for the Kayak rack and other camping equipment. By the way I have been driving around now for a few days with my boat on the roof of the van, and now I hardly think of it up there (always had it on a car before). I've been up to full speed on the motorway too, and on bumpy country roads - I'm now have total confidence in it. Well I am looking forward to this trip. As well as the things mentioned above, we can walk to the abandoned village of Port, visit Slieve League where there are the highest sea cliffs in Ireland, and camp out on the beach. The weather forecast is looking ok - fingers crossed..